Contrary to popular thought, Cinco de Mayo is not Mexico’s Independence Day. Instead, this day celebrates Mexico’s victory over French forces at the Battle of Puebla on May 5, 1862. In America, Cinco de Mayo is celebrated by enjoying Mexican cuisine – and Wichita has the perfect supplies for your fiesta. Tacos, guac, margs and more! Every Wichitan will tell you, we’ve got the best local Mexican cuisine in Kansas. 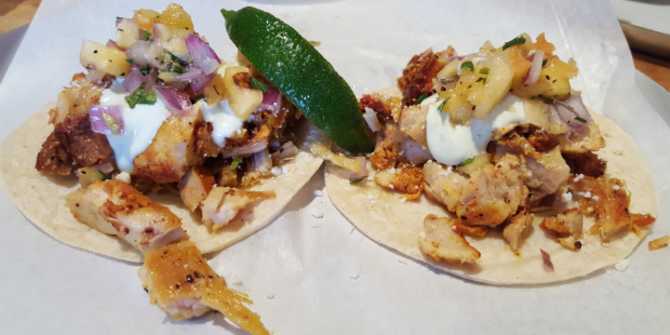 Celebrate the street taco at District Taqueria, featuring scratch-made salsas, house-marinated and roasted meats, fresh locally-made tortillas and a full bar. District Taqueria is in downtown Wichita at 917 E. Douglas. Ruben’s Mexican Grill is at 915 W. Douglas. Enjoy contemporary Mexican cuisine at Molino’s, voted one of three best Mexican restaurants in Wichita and current favorite of the Wichita Eagle’s dining editor Denise Neil. Boasting the best margarita in town, residents and visitors are invited to taste one for themselves. Find Molino’s Mexican Cuisine in Midtown at 1064 N. Waco and at 7817 E. 37th St. N.
Carlos O’Kelly’s Mexican Café is a Wichita favorite with locations spanning the compass in town. Carlos O’Kelly’s inspired Mexican cuisine is prepared from scratch daily with delicious salsas and traditional Mexican favorites. Find Carlos O’Kelly’s at one of four Wichita locations, including 7703 E. Douglas, 527 S. Ridge Rd., 3025 N Rock Rd. and 4872 S. Broadway. Serving food, fun and unique experiences, these Wichita-area businesses, bars and organizations know how to party! The Sedgwick County Zoo invites you to a Cinco de Mayo Celebration noon-5 p.m. Sunday, May 7, featuring authentic Mexican food, live music and fiesta fun! Regular admission applies. Members are free with photo ID. Visit the Sedgwick County Zoo at 5555 Zoo Blvd. Dance for your calories with a Cinco de Mayo dance party lead by Zumba with Ching at 6:30 p.m. Friday, May 5 in Old Town Square. No tacos and margaritas here, but after the class, find your way to any of Wichita’s Old Town District restaurants and bars! Old Town Square is located at 2nd & Mead. Kick off the weekend at Aero Plains Brewing with a Cinco de Mayo celebration featuring the new El Piloto Loco Vienna Lager, a Mexican-style lager, house-made margaritas and tacos by The Hungry Heart. Aero Plains Brewing is located at 117 N. Handley St. in Wichita’s Delano District. Enjoy street style craft tacos and Belgium style craft beers at Hopping Gnome Brewing Company with Chef Roberto Simmons 6-8 p.m. Friday, May 5. The Braised Amber Carnitas Taco uses Hopping Gnome-favorite Sepia Amber Ale. Hopping Gnome Brewing Company is located at 1710 E. Douglas in Wichita’s Douglas Design District. Barleycorn’s with DJ Carbon, J Skratch and Macrobiotics is hosting a Halfway to Halloween party 9 p.m.-2 a.m. Friday, May 5. Day of the Dead costumes are encouraged and will get you in at half-price before 11 p.m.
Barleycorn’s is at 608 E. Douglas in downtown Wichita. Grace Hill Winery’s first ever Cinco de Mayo party will feature local band Back Porch Buddha, food truck Uno Mas – serving a special Cinco de Mayo menu – and, of course, wine! Admission is $10 per carload, and there is no need for reservations. Grace Hill Winery is northeast of Wichita at 6310 S. Grace Hill Rd. in Whitewater, Kansas. J’s Lounge will open one hour earlier at 3 p.m. Friday, May 5 for its Cinco de Mayo celebration. A free Taco Bar complements drink specials during two happy hours – 4-7 p.m. and 10 p.m.-midnight. Find J’s Lounge is at 513 E. Central.